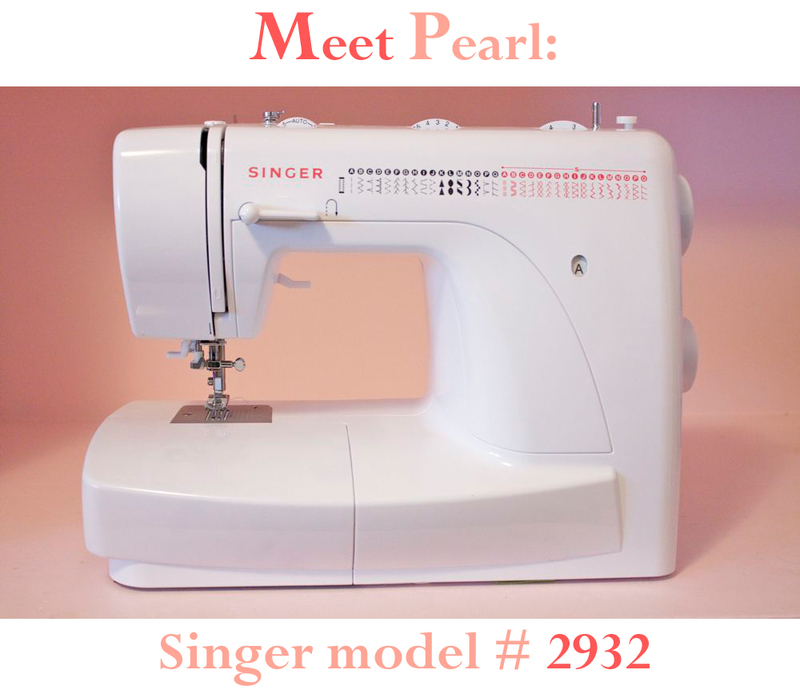 I've received so many emails from you asking for a sewing machine recommendation, and which machine I use, I thought I would address them all at once! So there it is-my machine! Unfortunately this is the only machine I've ever owned, so I can't be much help in recommending others, but I would like to put a little plug in for Husqvarna, if you can afford one. My mom has had hers since the '70's it's what I learned on. Their machine's are (were?) definitely built to last! Plus, it's just fun to say "Husqvarna", you know? Oh this makes me so happy! I have the exact same one! I bought it for myself two and a half years ago in hopes to teach myself to sew. Thanks to your wonderful beginner's lessons, I'm on my way! Glad to know you like your machine - I don't have enough experience to know the difference. Thanks for your opinion! I have an Elna Quilters Dream 6003 and absolutely love it. However, they quit making Elna machines from what I have been reading and if mine ever dies I may be in big trouble. Reviews I read about it had pros and cons and I have had no problems at all. I have a singer and a husqvarna, and I love them both (and I too love saying husqvarna). My singer refuses to do buttonholes too! What's up with that? I just upgraded to the Singer Quilter Confidence and I love it. My machine before that is a 8 year old 80$ Target Singer. It still works, great! The only reason I upgraded is I am trying to learn how to quilt and the feed dogs don't drop on the old one... Upside when I got the new one, I got all sorts of presser feet to go with it too! wow! you got lucky, because I bought the same machine for my 1st one, and not only was it messed up straight out of the box, but once that was finished it broke again! I had it for 6 months and maybe got to use it 5 times. Luckily, singer is really good about repairing stuff. I ended up giving it to my mother, and bought a brother. I say, if it works, keep on using it. I guess it's kind of like cars...you hear of the one car that has terrible reviews, but yours works great. I am in the market for a new machine - Thanks for the recommendation! My daughter calls my sewing machine "Bertha." I don't know why exactly. I've had her since I turned 16 (or 17?) and my mom decided I needed my own. She was probably $150, way back then (17 years ago!) which was a lot for my parents. And I still have her. Sometimes I have to do minor surgery on Bertha to keep her well oiled and running. But she's my best companion and she's been with me longer than my kids have! I have a 1961 Singer Rocketeer named Stella. After reading about it and seeing pictures online (it's a gorgeous machine), I was lucky enough to find someone local selling one on Craigslist for less than I would have paid for a new machine. I was a little sad that it didn't have a table, but lo and behold, my husband's grandmother had one that she passed on to his mother and she passed on to me that works perfectly! My Stella is a workhouse, and I definitely believe the older machines were built to last with all metal parts and she can zip through the thickest fabrics and has a variety of stitches and all the accessories too (oh how I love the ruffler foot!). It feels so great to have a machine that I feel "in tune" with. I love sewing so much more since I got her. I bought a Brother Innovus 900d in February and I LOVE it. Not only is it a breeze to stitch with, it's a machine embroidery machine also. I would tell anyone, regardless of what kind of machine you buy, to purchase from a dealer. A dealer will be able to teach you all about your machine and service it properly. I have a White brand machine that is 20 years old. NEVER been serviced or cleaned properly (shame) and it still works great. Part of the reason it is such a workhorse is that it is all metal inside. Many new machines (and I'm side eying Singer on this one) are all plastic inside. They just aren't built to last. There is a slightly lower priced Brother that also does embroidery. If I was ready to spend a little more I probably would have purchased a Babylock. All good machines. I have a Pfaff and I do love it. My only issue with it is that it is a computer-syle sewing machine and computers have issues and this machine has issues. My poor sewing machine repair shop knows me by my first name! Luckily once they do a full service they will re-fix it whenever for free! I asked them about getting a "manual" sewing machine like the one you pictured and the lady said, "now why would you want to do that?" WELL...because they are reliable! I've also got an older husquevarna my grandmother gave me since she cannot sew anymore and I LOVE that one....it's "manual" but it feels so strong, sturdy, and smooth! and no computer to get attitude with me! Then my step mother gave me her baby lock serger...which I LOVE when I can get it to work. So many strings, it is very intimidating! Then to get the tension right...I get it all set and my lovely 2 year old comes over and messes with all the knobs! I must admit I LOVE Sewing machines. Am rather obsessive with them, and have 8 currently. I find the older/metal ones MUCH better than the new plastic models. My favs are a Pfaff and an Elna. Both bought used on "Ebay" for great pricing. My newer machines are a Janome Serger (love it) and Singer Embroidery machine (not worth the $800 but "ok") I have an old Singer in the desk I could barely get in my car from a yard sale (in storage now) three sergers from Craigs list, and three assorted sewing machines from yard sales...wait...that is more...I have a lot. LOL. And yes I still look at them at thrift stores and yard sales...I need to buy a house for them. The Sewing house. haha. Oh well, there are worse things to buy. I just started out sewing and have a Brother Xl2600 59 stitch, which was very inexpensive. My only complaint with it is that after two uses, the bobbin winder wouldn't work and I had to buy a small portable winder. Other than that it gets the job done pretty well. As my sewing gets more complicated I might upgrade, but for now, being unemployed, this little guy works for me! Silver Rose (beautiful name, btw), have you considered yard sales/Craigslist for an older metal model? They are simply awesome and you can get a nice one Singer, Kenmore, etc. for about $50! YW Silver Rose. I love your little bears on your Etsy, sooo cute! I have the same sewing machine and my automatic buttonhole maker works just fine, its the automatic threader that is not so good. I know it works cause I've done it before but on very rare and lucky occasions, most of the time it doesn't work so Ive just threaded my needle the old fashion way. I hope, after this "confidence" about your kind of maintenance... you give some oil to your lovely sewing machine!!! I have a Brother and I love it. Last summer I bought a serger for 40$ Canadian in a garage sale... and I love it to. It is so smooth. Singers are generally good machines. I have an OLD industrial Singer Sewing machine. It has oil on the inside that I have to keep up to a certain level and IT IS HEAVY--made of real iron. It sews through anything like nothing and keeps on trucking. It's hard for me to work on a home machine after her because they're soooo slow in comparison. I LOVE my Husqvarna. I got mine at a "biggest day of the year and this is the last one of last year's model" sort of sale, so I really got a deal on it. The ONLY drawback to a Husqvarna is that the accessories are also pretty expensive. The machine is awesome though - and mine does embroidery too! Yay for Singer! I LOVE mine! My grandparents bought me my first sewing machine when I was 10, and I still have it! (I'm 25 now) It is a 1940's model(I think) Singer that they bought at an auction. It's small and fits into a little box; its about the cutest machine I've ever seen. I wouldn't part with it for the world, and it does all the things I need it to! My husband bought me a new machine, the Brother 6000i for our 7th Anniversary. I LOVE LOVE LOVE it! I had the Singer Simple, but it was awful and broke after a short time. The repairs were going to cost more than the machine did! I have a brother that I got at walmart for less than a hundred. I had a janome because i did tons of research...but it broke. I got the ebay seller to replace it and it broke again, I gave up and got the brother...I love it! It's a fabulous machine to begin on. I originally got it only to use with scrap booking...but now I hardly scrap book and am trying to teach myself how to sew more projects! My mother has an old Husqvarna machine and it hates me... She also has a big green monster of a serger, it's attached to a table and the pedal is huge! I have a Elna Grafitti myself, I got it when I graduated from high school ten years ago but it's time to replace it soon. I might get a Husqvarna, although I don't have any special feelings saying it - but that might be because I'm Swedish. My husband bought me a sewing machine today! It was the best surprise ever! Her name is Beatrice, and she's a Singer Inspiration 4205. It's a very simple machine, only five stitches, but it has autotension! Very different than the wonderful machine I learned on with 50+ stitches, my mom's Pfaff, which I remember picking up at the factory in Germany.